We went to a pumpkin carving the other night, and I felt obligated to post this photo. 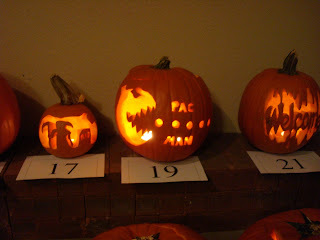 I wish I could say I created the Pac-Man pumpkin, but I was too busy eating to carve one (though I did help scoop out some of the gunk). So, anyways, what. Do you just buy a bunch of games and put an advertisement for your book in them and then resell them? Huh? Do ya?